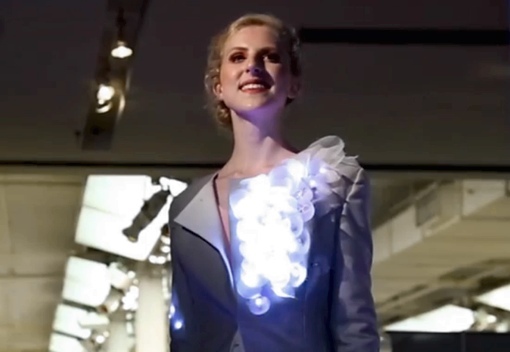 Would you wear an outfit built from glowing fiber optic cables or a computerized tie with built-in digital screens? The concepts are a bit too adventurous for my closet, but not for the folks walking the runway last week at the FashionWare Fashion Show in New York City. The event, an annual part of the massive CE Week tradeshow and conference, is meant to showcase the growing $8.3 billion wearable technology industry. And while the wearable space is currently focused on smartwatches and fitness monitors, in the future, you could be wearing jackets with built-in GPS trackers, dresses that change patterns with your mood and designer glasses that augment reality. Want to check out these future-forward fashions yourself? The brief video below showcases the best of the best – and weirdest of the weird – that hit the FashionWare runways. You may be skeptical, but when we’re all wearing blinking LED shirts ten years from now, don’t say you never saw it coming!